Hydrogenation in organic chemistry generally requires a metal such as palladium to work. Alternatives that do away with the metal are transfer hydrogenation (hydrogen donor is not hydrogen gas itself) and several true metal-free hydrogenation systems. A novel system was introduced by Stephan et al. 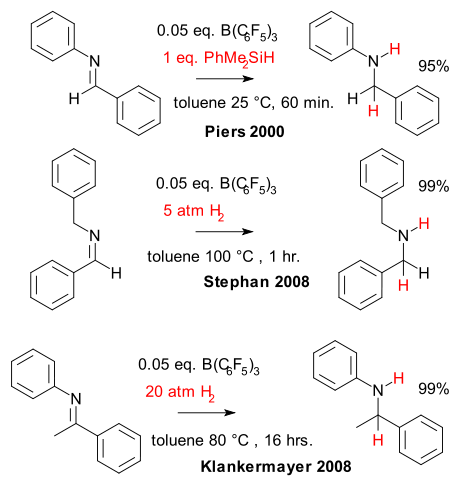 in 2007 ( DOI) for hydrogenation of imines with a amine-phosphine system called a frustrated Lewis pair. In a new 2008 report (DOI) Stephan replaces the catalyst by the much simpler tris(pentafluorophenyl)boron. This work was in part inspired by older work (2000) by Piers et al. DOI who used the same catalyst in reduction of imines in combination with a silyl hydride as hydrogen donor. Klankermayer et al. in 2008 ( DOI) were also motivated by the Piers work and produced very similar work as Stephan (only beaten by two months). It is known that hydrogen can react with alkyl boranes to borane hydrides and compounds like 9-BBN are will known reducing agents. Is this reaction type therefore true hydrogenation ?. Stephan thinks so, he proposes an iminium ion / hydridoborate counterion as a key intermediate.